Make your own carbon brushes. A magazine edit by Philip Worsfold. This article relates to the provision of contacts to provide the power for a working coaling crane. However, it’s equally useful as a method for fitting new, home-made brushes to old motors. 1. The good old Jouef 5-pole motor includes precious carbon brushes, which assure the contact with the rotor. 2. 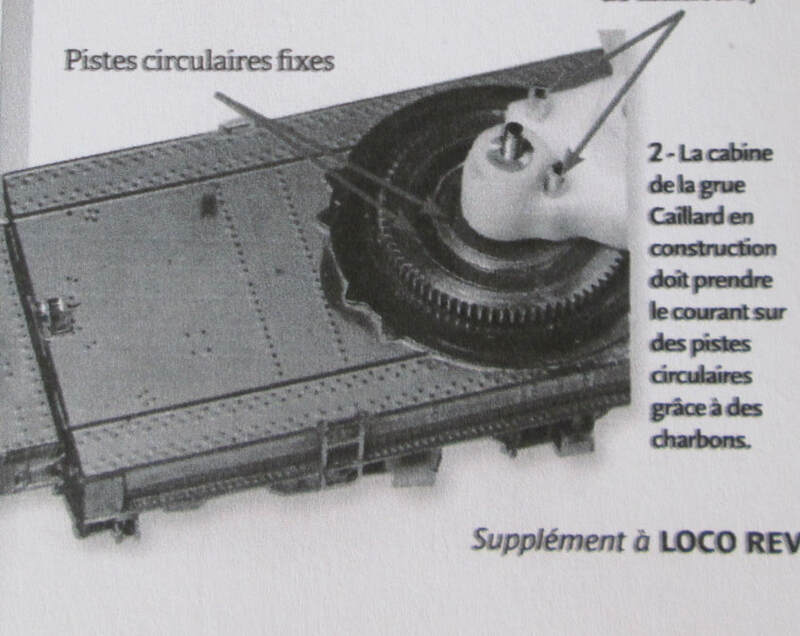 The cabin of the Caillard crane (under construction) must take current from the fixed circular strips using carbon brushes. Yes! There’s a provocative strand behind the title. For our little electric trains to work you have to conduct current to the motor’s armature. To achieve this you need the brush that rubs against the rotor to be in permanent contact (Photo 1). 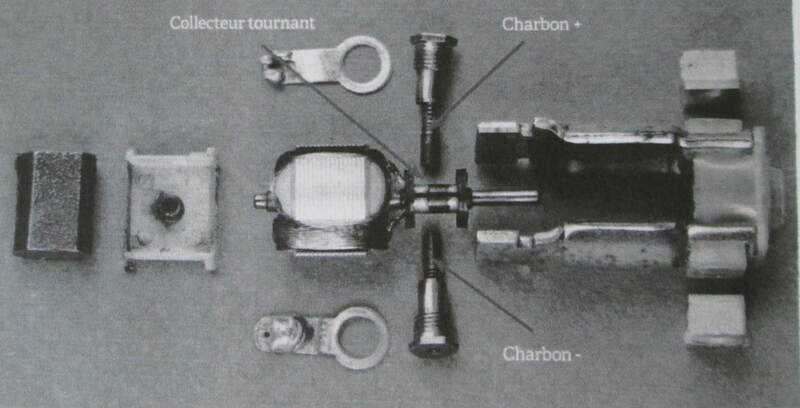 To ensure that the brushes rub well against the axis of the rotor, they must be made of a friable and conductive material (to adapt through use to the shape of the rotor) - Carbon. The obverse side of the medal is that the carbon gets used up. And when it’s used up, you’re lost when you can’t find replacements of the right size in the market place. And even if you can, the price is out of this world! This is exactly what happened with my Caillard crane (photo 2). I experienced a lack of continuity between the contacts and the circular strips. Therefore I tried to insert carbon brushes at the end of the brass tube contacts; but evidently suitable brushes for my crane existed… I’d have to make my own. To begin with, it was alluring and quick to sacrifice an old Jouef motor and take its brushes (particularly since these brushes were about the right size); but it seemed a shame to sacrifice a perfectly usable motor. The idea came to me to test a pencil lead, because the ‘lead’ is graphite! A few seconds sufficed to show that the lead would conduct current effectively. 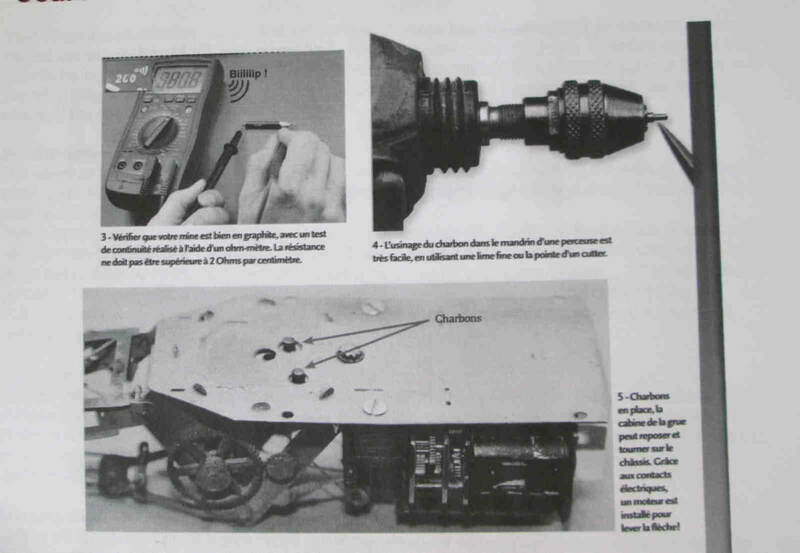 I used my Multimeter to check the conductivity by connecting it to the two ends of the lead (Photo 3 – caption: Check that the lead is good graphite using an ohm-meter. The resistance should not be more than 2 ohms per centimetre). Best to make sure you have a good supply of pencils! I broke off a short length of lead which I put in the chuck of my mini-drill and I worked it down to the exact diameter I required (Photo 4 – caption: The working of the carbon in the chuck of a drill, using a small file or the point of a cutter). In this particular case I needed a brush of 1.5 mm diameter, with a 2 mm shoulder at the end. The 1.5 mm part holds the brush in the brass tube and the 2 mm shoulder forms the contact surface. Obviously, depending on the shape and the required dimensions, you could use a builder’s pencil, which has two advantages. It feels greasy (which means it contains plenty of graphite) and its fatter (which makes it suitable for bigger brushes). And it works like butter! Take care not to push too hard; or you’ll break it. Translator’s note: Whilst the writer implies the use of a fairly soft pencil lead, he doesn’t actually stipulate a hardness. I would recommend nothing harder than HB. B is probably the best compromise. 3. Check that the lead is good graphite using an ohm-meter. The resistance should not be more than 2 ohms per centimetre. 4. The working of the carbon in the chuck of a drill, using a small file or the point of a cutter.